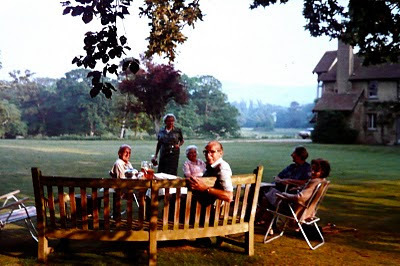 Marjorie and Tony Powell Edwards lived at Novington Manor, Plumpton, Near Lewes, East Sussex. The Powell Edwards family had owned the estate since 1885. On 15 October 1946 Captain Ivor Howell Powell-Edwards, known as Tony, who was born in 1909, married Marjorie Raphael of the Raphael banking family. He had previously married Vivien Nicoll in 1933 and had two daughters with her. He died in the Brighton area on 30 September 1979 aged 70. Like his father he was a soldier. He served in the Irish Guards from 1928 to 1932. He retired in 1932 as a Second Lieutenant. Then he went on to the Reserve Officers list and was promoted to Major. In WWII he served in Norway, North Africa and Italy. He was wounded twice. In 1956 Marjorie organised dances for her two step-daughters; Antonia who married Ian Joicy Dickinson in 1957, and Virgina who married Alec William Gordon in 1960 (ref: The Times). Tony’s father was Herbert Ivor Powell-Edwards (1884 to 1946). He was educated at Winchester and Oriel College, Oxford. He served in the Army for two decades and was awarded the DSO at Gallipoli. In 1927 he became a Lt-Colonel. Like Richard Raphael, Marjorie’s father, he was a good cricketer and played for Sussex. In 1921 he wrote a history of the Sussex Yeomanry. He was Chairman of the East Sussex County Council from 1934 to 1937. Rosemary, Marjorie’s sister, married her cousin Henri Raphael, on 28 June 1950. He had been awarded a Croix de Guerre and died in 1959. Rosemary died on 2 October 1972. Her addresses were given in the Times as 10 Rue Benouville, Paris 16, and Flat 3, 76 Sloane Square. A daughter called Marguerite was born in Kensington in 1953. Edith Rosa Raphael, the mother of Marjorie and Rosemary, died on 16 March 1962 and was cremated at Golders Green. Marjorie Powell-Edwards died in the Brighton area on 6 October 1987 aged 79.